A large-scale project is now under way, and the ContiTech Conveyor Belt Group is delivering conveyor belts and belt monitoring systems for the development and expansion of the Chilean copper mine in El Teniente, which is run by mine operator Codelco. More than 20km of steel cord belts are to be installed between 2013 and 2017. “We are absolutely delighted to be involved in this large-scale project and to support the expansion with our innovative products,” says Claus Peter Spille, head of the Mining World segment at the ContiTech Conveyor Belt Group. ContiTech conveyor belt systems have already been used in previous projects of Codelco.The conveyor belt specialist received this latest order via Tenova TAKRAF from Leipzig. The project Nuevo Nivel Mina is intended to open up new copper reserves in deeper layers of the mountain so that increased underground mining can now take place. With the new conveyor belt system, which will transport the mined rock, the mine operator implements energy-saving solutions. The steel cord belts from ContiTech are manufactured with an XLL Compound, a special, energy-optimized rubber composition. Since this rubber compound significantly improves visco-elastic properties, the indentation rolling resistance on the conveyor belt system is minimized. In comparison with conventional conveyor belts, this enables energy consumption during the transport of raw materials to be cut by up to 25%. In this way, energy costs and CO2 emissions can be significantly reduced. Alongside energy-optimized steel cord belts, the ContiTech Conveyor Belt Group is supplying innovative electronic conveyor belt monitoring and inspection systems for El Teniente. These systems are well suited for the diverse challenges of the copper mine and guarantee a high degree of safety and reliability. Conti®Protect monitoring systems protect conveyor belt systems against serious damage, thereby making a major contribution to enhanced operational reliability by reducing the number and length of malfunction-related downtimes. Conti®Protect Splice Elongation Measurement is designed to monitor larger conveyor belt systems and uses magnetic markers to detect irregularities in splice length. On conveyor systems with ever more stringent safety factors and ever increasing conveyor belt strengths, monitoring the splice increases the Mining World segment at the ContiTech Conveyor Belt Group. Conti®Protect Belt Rip Detection uses conductor loops vulcanized into the conveyor belt to detect longitudinal slits as early as possible. With improved conductor loops and low susceptibility to electromagnetic interference, the belt monitoring system prevents error messages and, in turn, costly conveyor downtime. Online support is also available. On request, the experts from ContiTech can log into the system and remotely check and optimize processes. Conti®Inspect systems provide data that can be used to derive reliable forecasts about the remaining service life of the conveyor belt, allowing operators to estimate investment costs more accurately. This makes a vital contribution toward reducing operating costs and protecting the environment. 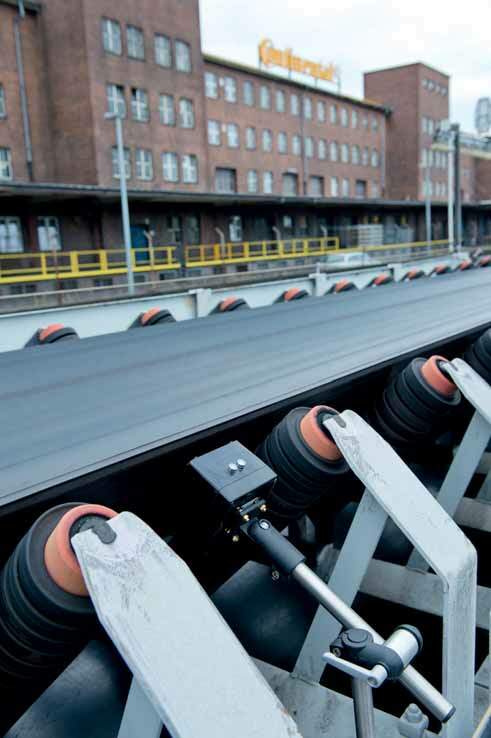 With the aid of laser sensors, the mobile Conti®Inspect Belt Thickness Measurement system determines the thickness of the conveyor belt across the full width of the belt. Surface damage can be detected at an early stage thanks to the revolutionary Conti®Inspect Continuous Surface Inspection system. State-of- the-art scanning technology is used to examine the surface of the conveyor belt and generate a detailed image of the belt surface and its condition. The Conti®Inspect belt monitoring systems can be used while the belt system is in operation. This avoids conveyor downtime for time-consuming inspections and reduces the expenses involved in conveyor belt inspections. Conti®Inspect Cord Monitoring uses magneto-inductive technology to monitor the steel cords of the tensile member and thereby improve the safety and reliability of the conveyor belt. systems for the automotive and commercial vehicle industry. From this collaboration derive innovative solutions for more security in conveyor belt systems. The newly developed belt monitoring systems of the ContiTech Conveyor Belt Group meet the high standards of the automotive industry and guarantee a high level of reliability.